Deutsche Welle (German pronunciation: [ˈdɔʏtʃə ˈvɛlə] ; "German wave" in German) or DW is Germany's public international broadcaster. The service is available in 30 languages. DW's satellite television service consists of channels in English, German, Spanish, and Arabic. While funded by the German government, the work of DW is regulated by the Deutsche Welle Act,  meaning that content is always independent of government influence. DW is a member of the European Broadcasting Union (EBU). International broadcasting is broadcasting that is deliberately aimed at a foreign, rather than a domestic, audience. It usually is broadcast by means of longwave, mediumwave, or shortwave radio, but in recent years has also used direct satellite broadcasting and the internet as means of reaching audiences. The European Broadcasting Union is an alliance of public service media organisations, established on 12 February 1950. The organisation is made up of 117 member organisations in 56 countries, and 34 associate members from a further 21 countries. It is best known for producing the Eurovision Song Contest. It also hosted debates between candidates for the European Commission presidency for the 2014 parliamentary elections but is unrelated to the European Union itself. As of 2018, around 1,500 employees and 1,500 freelancers from 60 countries work for Deutsche Welle in its offices in Bonn and Berlin. According to DW, its output reaches 157 million people worldwide every week. The Director-General of DW is Peter Limbourg. Peter Limbourg is a German broadcast journalist and the Director-General of Deutsche Welle. DW's first shortwave broadcast took place on 3 May 1953 with an address by the then West German President, Theodor Heuss. On 11 June 1953, ARD public broadcasters signed an agreement to share responsibility for Deutsche Welle. At first, it was controlled by Nordwestdeutscher Rundfunk (NWDR). In 1955, NWDR split into Norddeutscher Rundfunk (NDR) and Westdeutscher Rundfunk (WDR), WDR assumed responsibility for Deutsche Welle programming. In 1960, Deutsche Welle became an independent public body after a court ruled that while broadcasting to Germany was a state matter, broadcasting from Germany was part of the federal government's foreign-affairs function. On 7 June 1962 DW joined ARD as a national broadcasting station. Deutsche Welle was originally headquartered in the West German city of Cologne. After reunification, when much of the government relocated to Berlin, the station's headquarters moved to Bonn. Theodor Heuss was a West German liberal politician who served as the first President of the Federal Republic of Germany from 1949 to 1959. Beside the stern chancellor Konrad Adenauer, Heuss' cordial manners largely contributed to the stabilization of democracy in West Germany during the Wirtschaftswunder years. ARD is a joint organisation of Germany's regional public-service broadcasters. It was founded in 1950 in West Germany to represent the common interests of the new, decentralised, post-war broadcasting services – in particular the introduction of a joint television network. Nordwestdeutscher Rundfunk was the organization responsible for public broadcasting in the German Länder of Hamburg, Lower Saxony, Schleswig-Holstein and North Rhine-Westphalia from 22 September 1945 to 31 December 1955. Until 1954, it was also responsible for broadcasting in West Berlin. NWDR was a founder member of the consortium of public-law broadcasting institutions of the Federal Republic of Germany, the ARD. The German reunification was the process in 1990 in which the German Democratic Republic became part of the Federal Republic of Germany to form the reunited nation of Germany, and when Berlin reunited into a single city, as provided by its then Grundgesetz (constitution) Article 23. The end of the unification process is officially referred to as German unity, celebrated on 3 October. Following German reunification, Berlin was once again designated as the capital of united Germany. Radio Berlin International was the international broadcaster for the German Democratic Republic. On 22 June 2015, DW TV launched a 24-hour English-language news channel with a new design and a new studio as part of a rebrand to DW News . Previously, DW's news programmes were called Journal and broadcast in English in 3, 15 and 30-minute blocks. The new channel offers 30-minute updates every hour and 60-minute programmes twice a day on weekdays. DW News broadcasts from Berlin but frequently has live social media segments hosted from a specially-designed studio in Bonn. The German, Spanish and Arabic channels also received a new design. Kigali, Rwanda: A relay station in Kigali, Rwanda, was inaugurated on 30 August 1963, and provided coverage for Africa. This relay station closed 28 March 2015. DW used a relay station in Malta had three SW and one 600 kW-MW transmitter and gave partial coverage of the Americas, Southern Asia and the Far East. It was inaugurated on 29 July 1974 in exchange for a grant of almost 1 million GBP. The station closed in January 1996. DW (TV) : satellite television broadcasting mainly in German, English, Arabic and Spanish. DW Akademie is Deutsche Welle's international center for media development, media consulting and journalism training. It offers training and consulting services to partners around the world. It works with broadcasters, media organizations, and universities especially in developing and transitioning countries to promote free and independent media. The work is funded mainly by the German Federal Ministry of Economic Cooperation and Development. Additional sponsors are the German Foreign Office and the European Union. NHK World-Japan is the international broadcasting service of NHK, Japan's public broadcaster. The service is aimed at the overseas market, similar to BBC World News, DW, France 24, CGTN, and RT, and broadcast through satellite and cable operators throughout the world as well as online and through its mobile apps. The channel is based in Tokyo, Japan. Radio Canada International (RCI) is the international broadcasting service of the Canadian Broadcasting Corporation (CBC). Prior to 1970, RCI was known as the CBC International Service. The broadcasting service was also previously referred to as the "Voice of Canada". In June 2012, shortwave services were terminated and RCI became accessible exclusively via the Internet. It also reduced to services in five languages. CBC also ended production of RCI news. RIAS was a radio and television station in the American Sector of Berlin during the Cold War. It was founded by the US occupational authorities after World War II in 1946 to provide the German population in and around Berlin with news and political reporting. Deutschlandfunk, abbreviated DLF, is a German public broadcasting radio station, broadcasting national news and current affairs. Radio jamming is the deliberate jamming, blocking or interference with authorized wireless communications. In the United States, radio jamming devices are illegal and their use can result in large fines. DW-TV is a set of television channels provided by Deutsche Welle. The channels concentrate on news and information and first started broadcasting 1 April 1992. They are broadcast on satellite and produced in Berlin. DW English broadcast service is aimed at the overseas market, similar to DD India, WION, BBC World News, France 24 and RT. 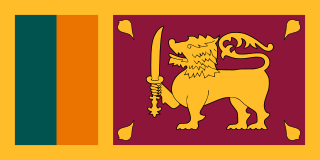 Radio broadcasting in Sri Lanka dates to 1923. Radio broadcasting, like other forms of media in Sri Lanka, is generally divided along linguistic lines with state and private media operators providing services in Sinhala, Tamil, and English language. Radio Nepal is the state-owned Radio broadcasting organisation of Nepal, which was established on 2 April 1951. Initially, the transmission lasted for 4 hours and 30 minutes through a 250-watt short-wave transmitter. Over the years, Radio Nepal has strengthened its institutional capacity considerably and diversified itself in terms of programme format, technical efficiency and coverage. Radio Nepal airs programmes on short wave medium wave (AM) and FM frequencies. Radio Australia is the international broadcasting and online service operated by the Australian Broadcasting Corporation (ABC), Australia's public broadcaster. Most programming is in English, with some in Tok Pisin and French. The Namibian Broadcasting Corporation is the public broadcaster of Namibia. It was established in 1979, under the name South West African Broadcasting Corporation. The Journal was a news programme on Deutsche Welle broadcast from its studios in Berlin, Germany. It was broadcast every day, usually on the hour, and was available in English, German, Spanish and Arabic. These were broadcast via satellites to different parts of the world, but all these channels could be viewed via the media centre on DW's website and are often relayed via local broadcasters/channels. DW (Español) is the regional version of official German TV Deutsche Welle for the Americas. The program orients itself towards news and information and was relaunched on 6 February 2012. The program is broadcast via cable and satellite and produced in Berlin. PCJ Radio (PCJ) is a private international radio station and syndicator and relay service founded in 2008 and based in Taipei, producing and transmitting programs for local and international audiences. PCJ has also distributed content via web technology since 2009. The station is owned by Canadian-born announcer and producer Keith Perron. The Mongolian National Broadcaster is the official, state-funded broadcaster in Mongolia. DW News is a global English-language news and information channel from a German international broadcaster Deutsche Welle (DW). ↑ "Deutsche Welle Act". Deutsche Welle. Retrieved 2018-01-24. ↑ "Profile DW". Deutsche Welle. Retrieved 2015-07-05. ↑ "Profil DW" (in German). Deutsche Welle. Retrieved 2017-11-06. 1 2 "1950–1954". Deutsche Welle. Retrieved 19 July 2015. ↑ "1955–1959". Deutsche Welle. Retrieved 19 July 2015. 1 2 3 "1960–1964". Deutsche Welle. Retrieved 19 July 2015. 1 2 3 4 5 "2000–2005". Deutsche Welle. Retrieved 19 July 2015. 1 2 "1990–1994". Deutsche Welle. Retrieved 19 July 2015. 1 2 3 "1995–1999". Deutsche Welle. Retrieved 19 July 2015. 1 2 "1965–1969". Deutsche Welle. Retrieved 19 July 2015. ↑ "1970–1974". Deutsche Welle. Retrieved 19 July 2015. ↑ "Broadcasting Democracy to Belarus". Belarus Digest. Retrieved 15 May 2015. ↑ (in Russian) "Data" (PDF). www.bundestag.de. ↑ "Learn German". www.dw.com. Retrieved 2017-08-05. ↑ Deutsch, Warum Nicht?. Deutsche Welle. Retrieved 5 August 2017. ↑ Two New Dedicated Channels Provide Gateway to Europe: Two DW-TV channel launched in Asia Deutsche Welle. ↑ "No more DW-TV on Sky/Astra". Boards. Retrieved 15 May 2015. ↑ "Changes in radio broadcasts starting this summer". Deutsche Welle. Retrieved 19 July 2015. ↑ "Etataufstockung: Deutsche Welle erhält mehr als zehn Millionen zusätzlich". ↑ (www.dw.com), Deutsche Welle. "The climate cover-up - big oil's deception | All media content | DW | 25.02.2018". DW.COM. Retrieved 2018-02-26. ↑ Supran, Geoffrey; Oreskes, Naomi (2017). "Assessing ExxonMobil's climate change communications (1977–2014)". Environmental Research Letters. 12 (8): 084019. doi:10.1088/1748-9326/aa815f. ISSN 1748-9326. ↑ Vivian Sequera and Andrea Shalal (April 15, 2019), German state-owned TV says it returns to Venezuela screens Reuters . ↑ "Transmitting from the hilltops of Kigali". Deutsche Welle. Retrieved 19 July 2015. ↑ Deutsche Welle Short Wave. ↑ "Who we are". Deutsche Welle. Retrieved 15 May 2015. ↑ "Traineeship Program". Deutsche Welle. Retrieved 19 July 2015. ↑ "About us". Deutsche Welle. Retrieved 19 July 2015. Wikimedia Commons has media related to Deutsche Welle .